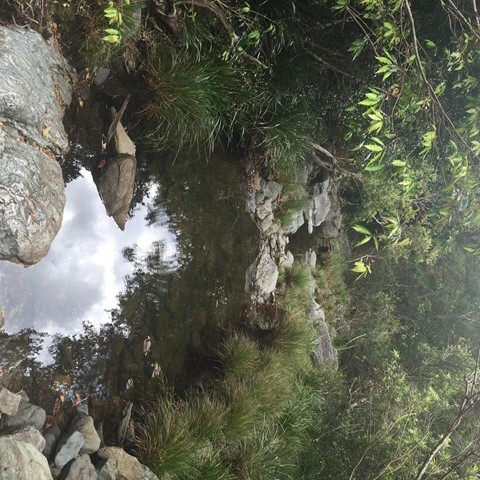 This is a beautiful walk around a large section of the bushland in which Enoggera Reservoir sits. 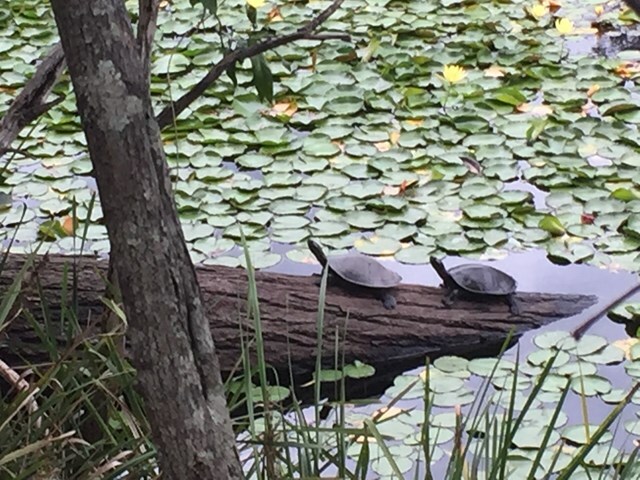 You will walk through lots of varied vegetation, keep an eye out for goannas, lots of different birds and turtles sunning themselves on a log in the dam. A great way to spend 4 hours! 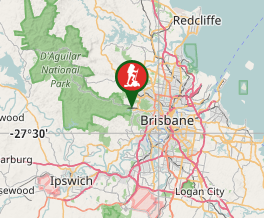 I do recommend that you have a map - you can purchase the topographical map from Walkabout Creek. Start out from the bottom carpark at Walkabout Creek, take the small track to the far right that follows Mt Nebo road. There is a very steep hill right in front of you! Follow this track for about 2 km, (turn around every now & again and you will catch glimpses of The Brisbane City skyline), The track will split - stay on the track that is to the right, still following Mt Nebo road, which is also on your right (you can't really see the road) for about another 1km. You will come to a bit of a clearing under the power lines - turn around and enjoy the view out over The Gap! 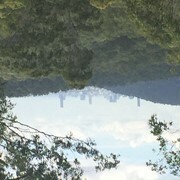 There are great views of Mt Cootha on your left and the mountain range in the distance (that I don't know the name of!). There is quite a steep descent down to a beautiful creek - take some time to enjoy a rest here as there is a VERY steep ascent ahead of you! It's probably about a 600 metre climb, which will bring you out under another power tower. Look over to the next tower - that is where you are heading! Continue along the trail for about another 1 km and you will come to a T junction, stay left for another couple hundred metres to another junction - go left again onto Fire Break 69. Don't forget to look over to your left when you reach the power tower and see how far you have come! Continue down Fire Break 69 until you reach another junction - this is McDonalds Loop. We went to the left and followed it down to the end where it hooks up to the Enoggera Reservoir loop - again we went left and followed the trail back along the reservoir to Walkabout Creek. Walkabout Creek is at 60 Mt Nebo Road, The Gap. There is a bus station about 200m down the road. Nice walk - have to work for the views though! Lots of steep ascents. Definitely use a map - topographic is great, but Google maps actually has most of these fire trails marked & named, so that was enough for us. The only instruction I'd add would be that at the power lines you have to turn sharp left and head down hill - towards the tower in the distance. We did this in 3.25 hours - reasonable level of fitness, but it was hard work! Hiked this in the pouring rain - a few wet crossings. Fairly easy route finding. Agree with the difficulty rating, was quite steep in parts. A nice scenic hike. Some sections of the track needed some maintenance, either from erosion from rain washing out the trail or grass overgrowing the track at the time of our hike. 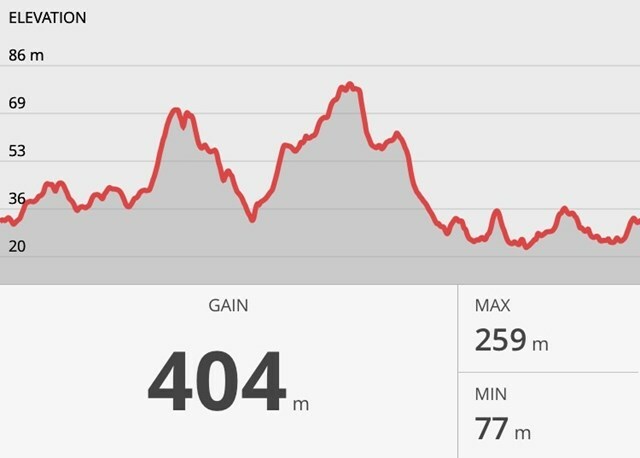 The uphill sections where more numerous than expected and steeper than expected. Agree with trail ranking as hard. No signage but the directions on this site are spot on. Thanks!